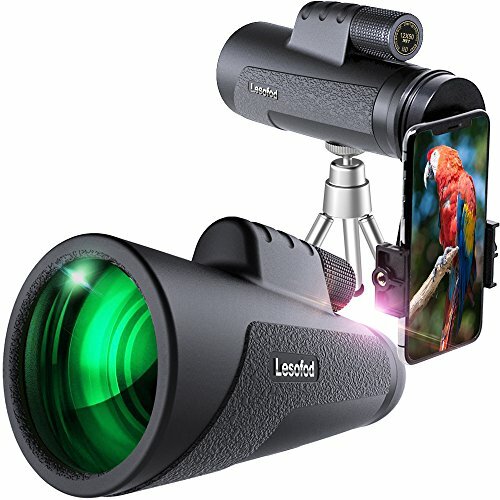 Lesofod 12X50 High Power Monocular is equipped with FMC(fully multi-coated) green film lens and clear BAK4 prism, 12X power and 100% nitrogen filled solid construction, provides a good addition for any outdoor enthusiast, perfects for sightseeing, sports games, hiking, hunting, climbing, bird watching, watching wildlife and scenery and other outdoor activities. The prism monocular is more convenient connecting your cell phone with phone clip. The perfect partner for camping, fishing, hiking, sporting events, concerts, bird watching and traveling etc. Do not look the sun directly with this monocular, otherwise, it will hurt your eyes. Put it in a dry and clean place for a long time unused. Wipe the lens with a dry and clean cloth. If there are some stubborn stains, please use the cloth dipped some alcohol. It would be easy to remove. 12X50 high power monocular：Full 12 x magnification and 50mm objective lens diameter to see a clear and bright image. Enjoy the best view of your outdoor adventures. Perfect for hiking, hunting, climbing, birdwatching, ball games, watching wildlife and scenery. BAK-4 Prism and fully multi-coated lens: Strengthen the key function of a monocular, guarantee superior light transmission and brightness, which makes your view clearer and delivers crisp images. Built-in lens dust cover prevents the lens from dust/moisture/debris, make sure you see everything in a clear detail. Waterproof, dust-proof, and shockproof design: Nitrogen-filled and sealing property ensures the living waterproof, fogproof, dust-proof functions. Rubber armor with stripes makes it usable to withstand the toughest weather conditions. Perfect accessories: Extendable stable tripod and phone clip which compatible with iphone and most other smartphones on the market that help you to get an HD image or video easily. Enjoy your monocular more perfectly. If you have any questions about this product by Lesofod, contact us by completing and submitting the form below. If you are looking for a specif part number, please include it with your message.